Today was a devastating blow. We only have a few days left in the field and we have still not heard a single chimp call or seen a trace of one on a camera trap. This does not mean that there are no chimpanzees present in the area. We find fresh feeding sites on a daily basis, smell fresh urine and have even been lucky enough to find some feces. Every day we wake up with the sun, suffer through our breakfast of stale bread and tea and set out into the bush. Almost all of the forest left borders the Pampana River, so much of our time is spent tracing the winding water up through the Tonkolili District. This brings us through the agricultural fields of other villages where we are able to find some people willing to answer our questions about chimps. We ask things like which animals raid your crops? If chimpanzees are named as a culprit we ask what they take and what time of the year, and approximately how many chimpanzees are seen. We are often told outlandish tales of 50 or more chimpanzees storming the fields and chasing the people off. They are many legends about the chimps that infiltrate the culture and often lead towards a negative image for the great apes. 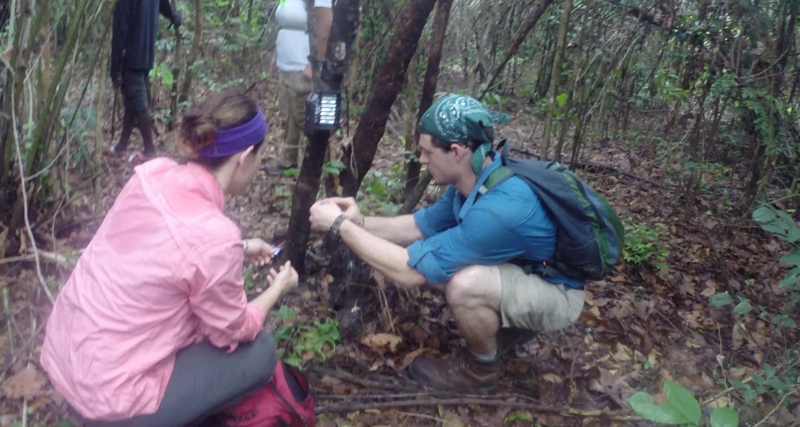 Setting up camera traps and finding feces! The perfect image of a successful field day. I heard of one story where a chimpanzee trapped a baboon by lifting up a tree root and putting the baboons head underneath it. Nothing can defeat a chimpanzee, according to many stories. Although some say that the crocodile is its only predator, others say the chimp can easily kill the crocodile. Many people tell us that they do not wish to hurt the chimpanzees, as they are too much like us. In fact our hunter turned conservationist says that he hopes to never hurt another chimpanzee as long as he lives. They are his brothers now. The people that are willing to help us often tell us whatever we want to hear, so when they say that they would never even think of hunting chimpanzees, we have to look at the evidence before believing what we are being told. We are told that their Muslim religion keeps them from eating chimps and monkeys (they can not eat something that has hands like a human), but we know that they will eat them if they are caught in snares or if goat is too expensive. Though the villages like Marockie, Manoni and others have shown us incredibly hospitality, we know that they lie to us. It is to be expected when strangers come in and attempt to change their ways. But we had an incredible show of trust by Amani, our forest guide and hunter turned conservationist. 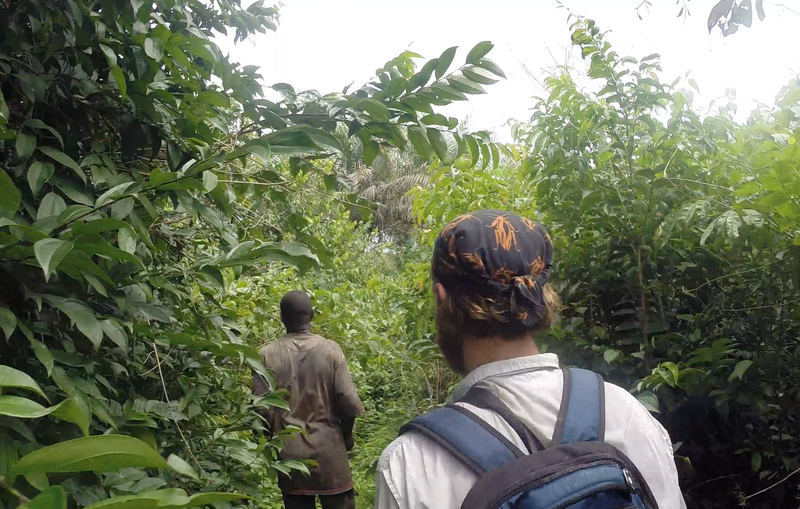 After a long and fruitless trek through the bush we were approaching a village where a car would arrive to pick us up. Amani paused and swung his machete into a stump, chipping away at it silently while the stragglers at the back of our group caught up. A map of where we were in Sierra Leone. The red circle is Marockie and our camp, the yellow circle is the village we were at when we found out about the hunting, though this village did not participate in that hunt. 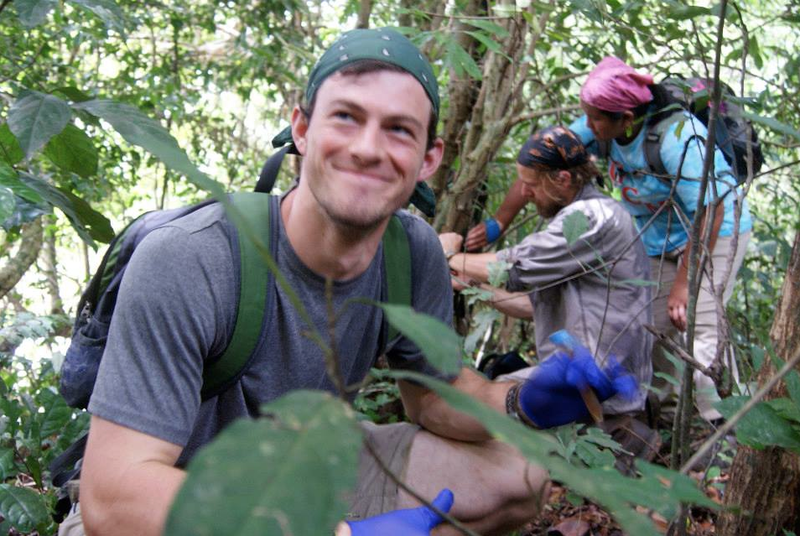 Andrew began a discussion with Amani regarding hunting practices of chimpanzees in the area. “They hunt in dry season, January to April,” Amani told us. This was not surprising news to us. At the time we did not know that the reason that they hunt in the dry season is because of religious rituals. I had believed that food must be less plentiful because it is the dry season, but many things are ripe in the winter that are not in the summer, namely mangos. The people use chimp parts for ceremonies to help their children grow up to be strong, or to cure respiratory ailments which plague the villages due to the winds coming off of the Sahara. The meat is not the reason for hunting. The hunter must have a buyer lined up to purchase the bones, teeth and fur, or else the kill is worthless. Chimpanzee meat is worth less than a third of the price of goat at a market, so there is no money to be made that way. But if the hunter can secure a buyer interested in the bones, teeth, ect. then he has the opportunity to make about 500,000 Leones ($1,000 USD), and the only punishment if the hunter is caught is a 5,000 Leone fine ($1 USD). “Two babu were killed in April,” Amani tells us. Babu is the Temne word for chimpanzee. We are shocked into silence. This April? Just two months ago? Two of our precious, silent, invisible, chimpanzees? Our estimated population count hovers around 30, and now two have been killed? After we had been told over and over again that no one had touched any chimps in the area, we find out that that too was a lie. But Amani became our hero that day, our shining success in the dark, quite jungle. The hunter had been a close friend of his for many years and had been hired by a neighboring village, Masupir (excuse my spelling with these villages, many of them do not seem to have a set way of spelling as it changes with every local you ask), to kill two chimpanzees. While hunting these chimps is illegal it is punishable only by the small fine mentioned above. This would not suffice as punishment, it seemed, for Amani. Amani guiding us through the bush. He was always making sure we had an easy path. Amani reported his friend for possession of illegal weapons (all guns are illegal in Sierra Leone), and had him arrested. At that moment the man who had come from 40 miles away into our project’s territory, a forest we were all incredibly protective over, to kill these chimps at the order of Masupir, was sitting in a Sierra Leonean jail cell. It was an infinitesimal win in the huge loss our project suffered that day. This hunt explained why the chimpanzees had been silent since we had arrived. It explained why they seemed to rarely be descending to ground level. It also made it clear how far we had to go, but thanks to Amani, it also showed us how far we had come. Every seemingly small gain will I’m sure in the long run help conservation. It is also a battle of hearts and minds and you are all really giving so much valuable input.